Texas to California businesses: Move here! 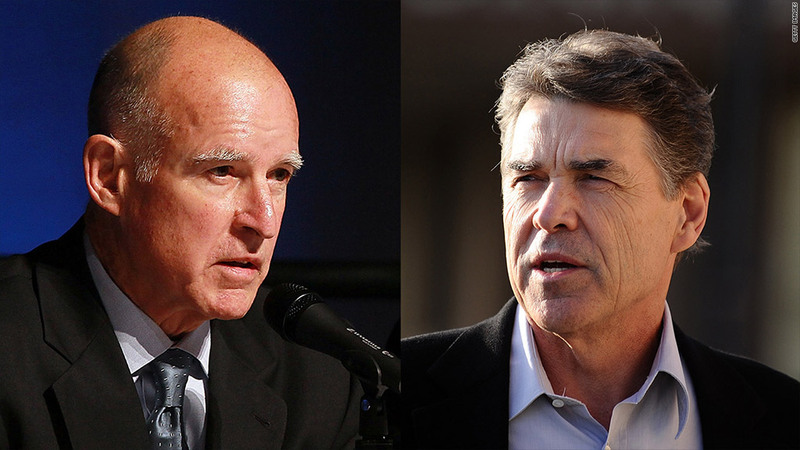 Texas Governor Rick Perry, right, wants to lure businesses from California, after its governor, Jerry Brown, pushed through a tax hike. Texas Governor Rick Perry has three words of advice for California businesses: Move to Texas. Perry has launched a high-profile battle for California companies, running radio ads in California touting the Lone Star State's low taxes and favorable business climate. The ads will be heard in San Francisco, Sacramento, Los Angeles, San Diego and the Inland Empire area east of Los Angeles. "Building a business is tough, but I hear building a business in California is next to impossible. This is Texas Gov. Rick Perry, and I have a message for California businesses: Come check out Texas," starts the 30-second spot. Perry notes that his state has won the Best State for Business title from Chief Executive magazine for eight years running. He noted that the cost of doing business in California is 6.3% above the national average and Texas' is 4.6% below it. This is not the first time Texas has looked to raid California for businesses. The governor has made several scouting trips and has written letters to California companies in the past. And, according to the governor's office, nearly three dozen California companies have relocated or expanded in Texas during California Gov. Jerry Brown's term. Texas isn't the only one knocking on California companies' doors. Several states have courted Golden State businesses in recent years, particularly during California's budget turmoil. California officials, however, aren't that concerned. Business relocations account for only .03% of annual job losses and the state is doing well economically, according to the Governor's Office of Business and Economic Development. "I can understand why Rick Perry is interested in California. We were the national jobs leader for most of the last year with 257,000 new private sector jobs," said Kish Rajan, the office's director. "Real job creation comes from California's history as a national leader in start-ups and the expansion of homegrown businesses." But Perry sees a new opening with California's recent tax hikes, which he says "increases California's already excessive income and sales tax." He pointed out that Texas has no state income tax and a low business tax cut. Perry even reminded golfer Phil Mickelson, who recently complained about taxes in California, about that fact. "Hey Phil....Texas is home to liberty and low taxes...we would love to have you as well !!" Perry tweeted last month. Are you looking to leave California because of the recent tax increase? If so, email tami.luhby@turner.com. You could be profiled in an upcoming story.